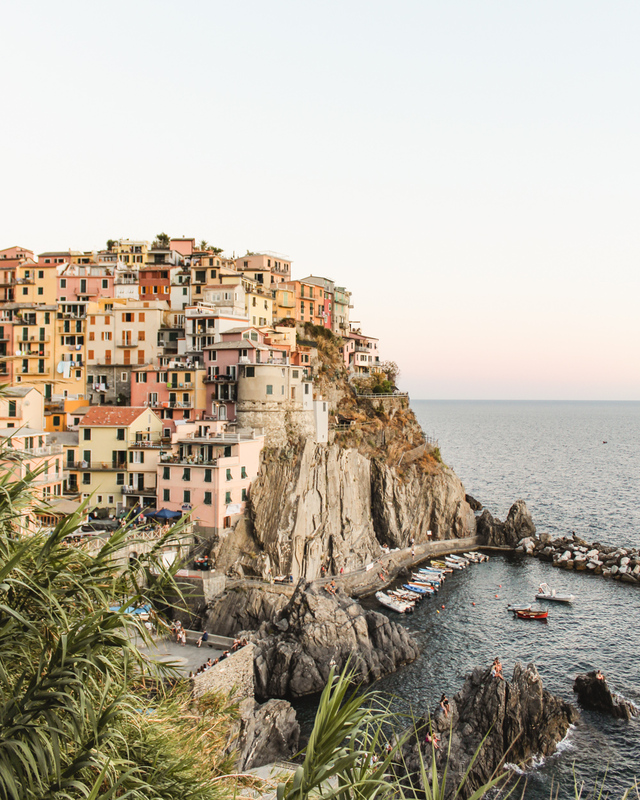 I couldn’t resist the chance to spend a few days in Cinque Terre to enjoy the warmer weather, see these stunning towns and eat mass quantities of pesto. 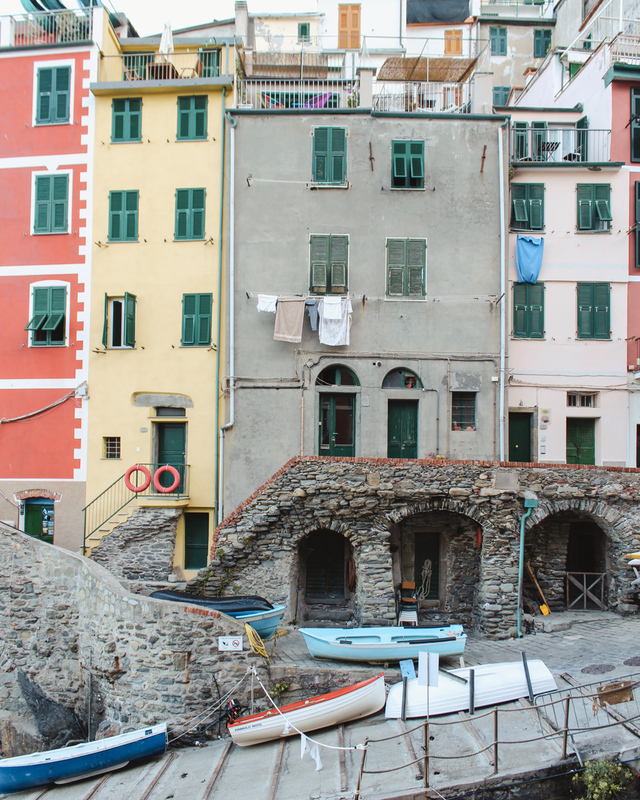 The last time I visited Cinque Terre it was in late September and the towns were transitioning into the off season. Although there were more crowds this time around, it’s nice to enjoy a beach destination under the sun and on the sand. 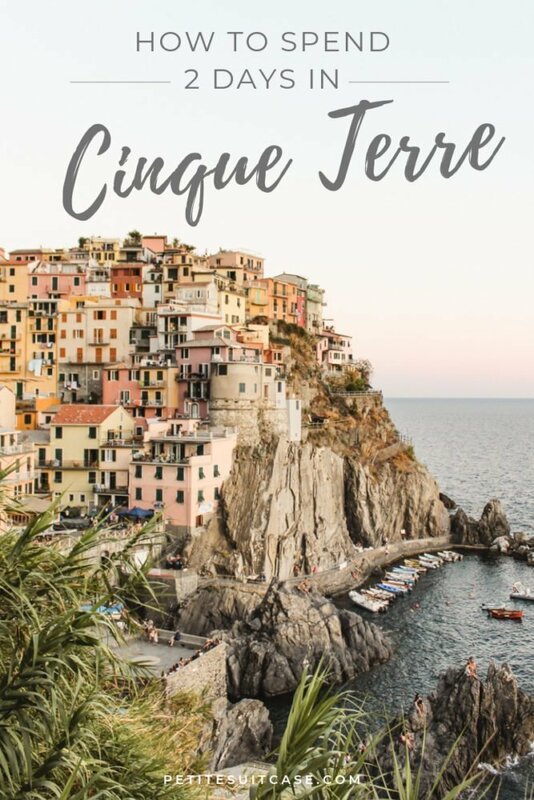 In this itinerary, I’ll share how to see Cinque Terre in two days with transportation tips, what to do in Cinque Terra and, of course, what to eat and where to drink along the way. 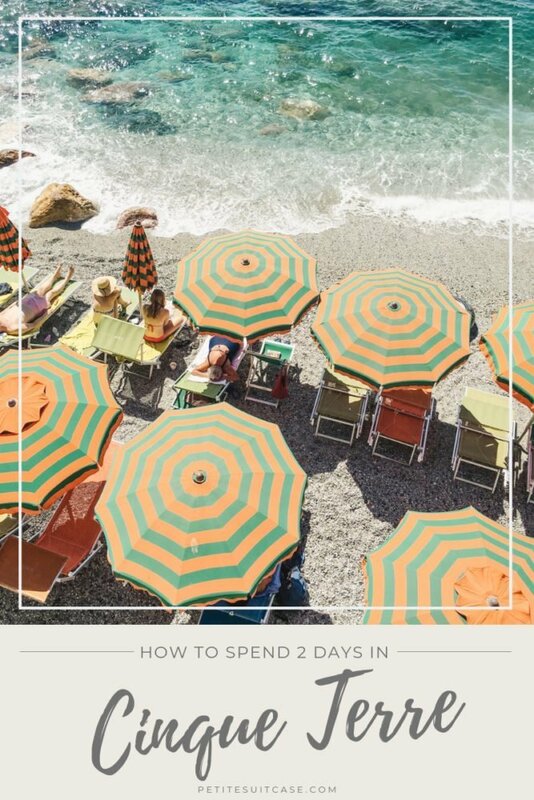 How long should I stay in Cinque Terre? It’s easy to see Cinque Terre in two days if you want to have a few nice meals, relax on the beach and see the sunset with a cocktail. 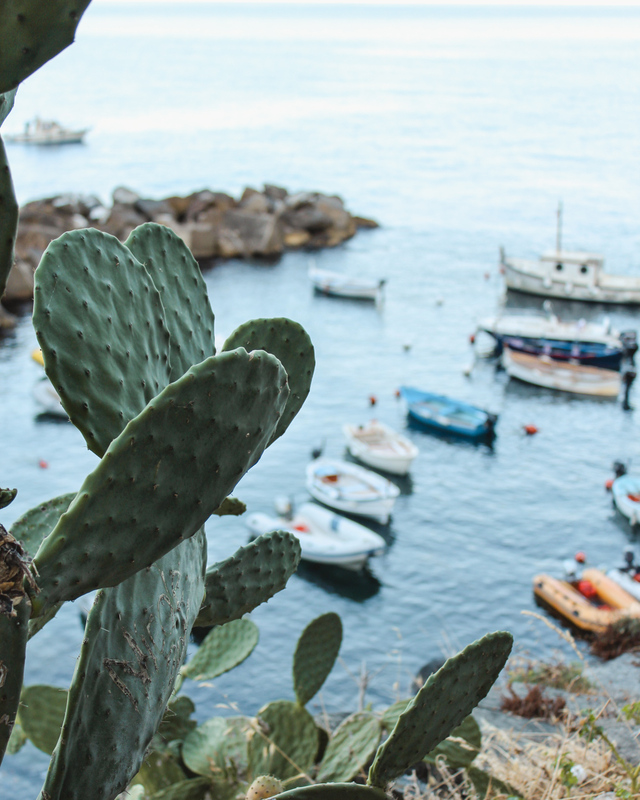 However, if you want to really spend time time in each town, leisurely do a hike and have a full beach day, you might want to take 3 to 4 days. 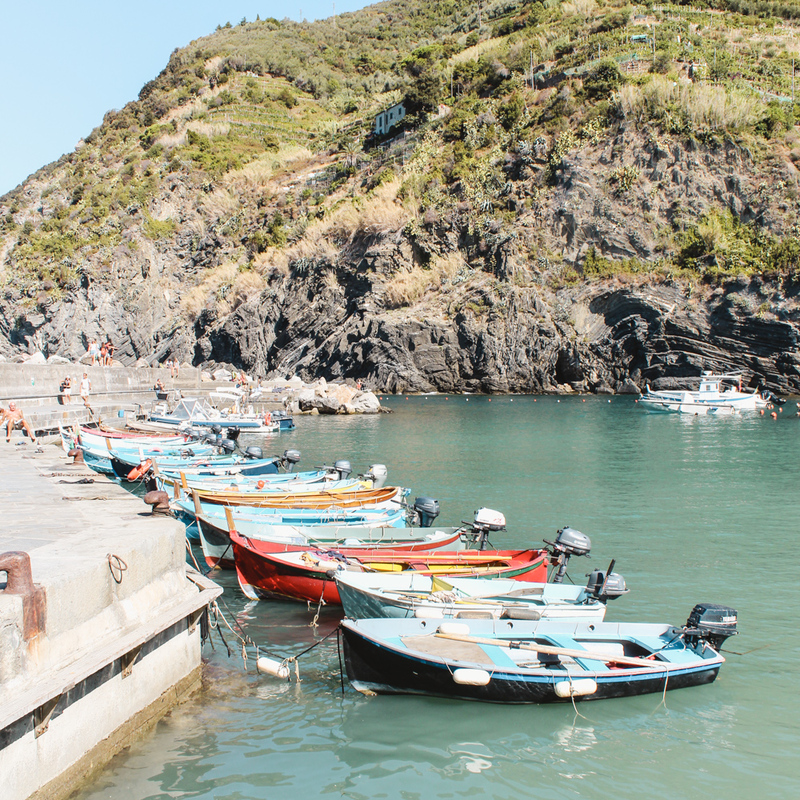 I’ve heard of people doing Cinque Terre as a day trip from Florence. I’ve never done that, but I wouldn’t recommend it. That is just way too much transportation for one day and you wouldn’t enjoy it as much being that rushed. 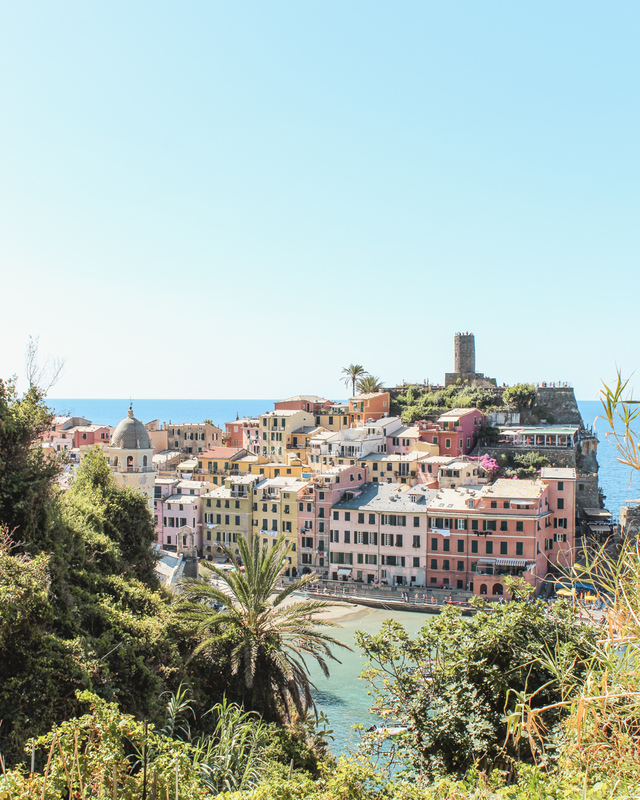 I started the day in Vernazza, arriving on the late morning train with the first heard of tourists, eager to see this slice of Italy. 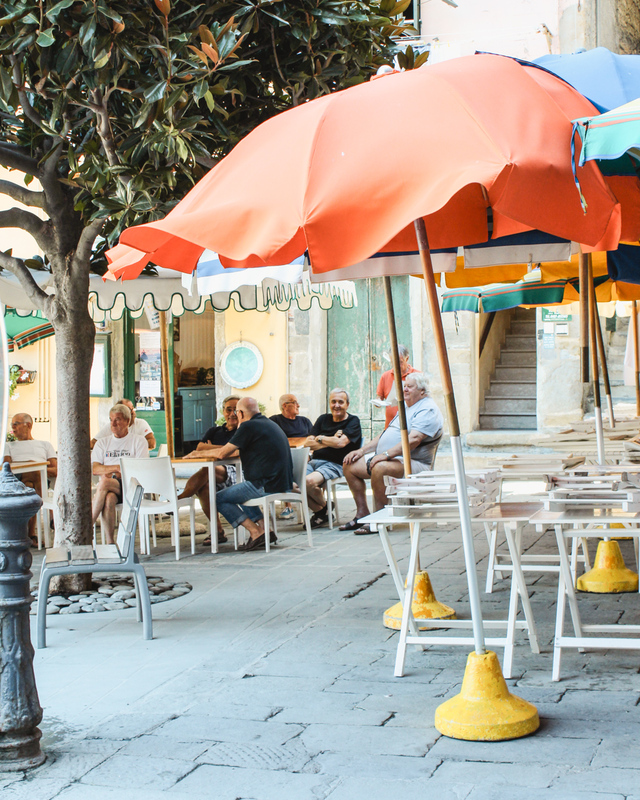 Old Italian men were still in the piazza having their morning cornetto and caffé and the beach was still empty. 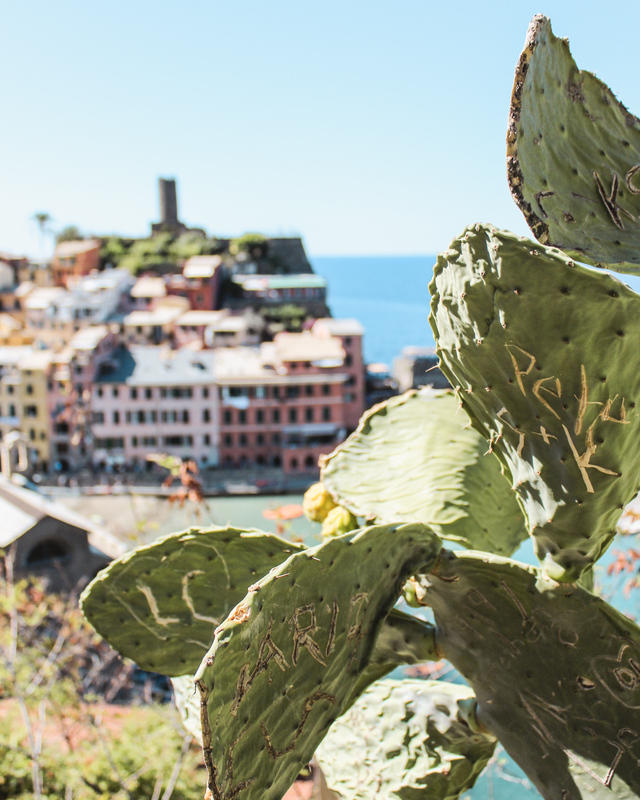 I headed straight to the best view points in Vernazza, the castle (€1.50 entrance fee) and the hiking trail to Monterosso. Not only is the Cinque Terre Train Card the best way to go if you plan on hitting multiple towns in one day, you’ll need it for access to this part of the trail. 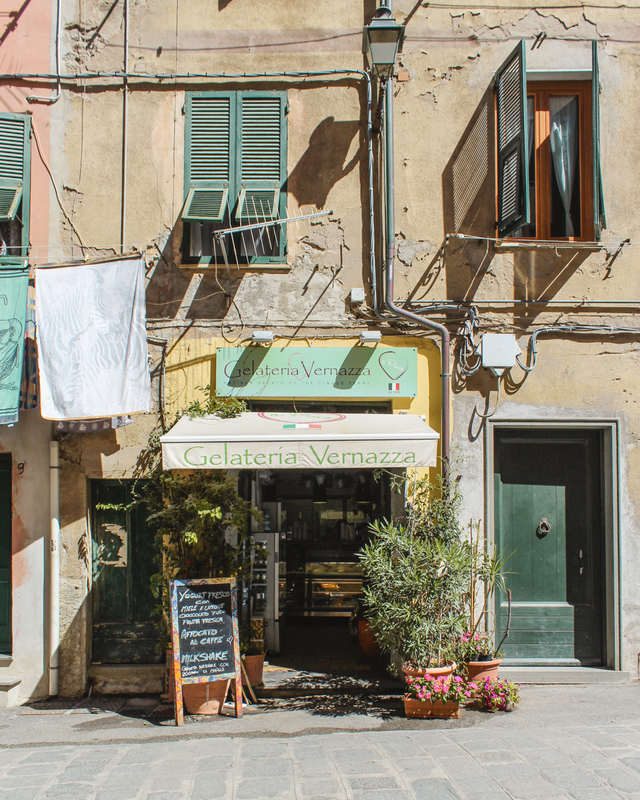 It might be a little early, but you NEED to experience Gelateria Vernazza. 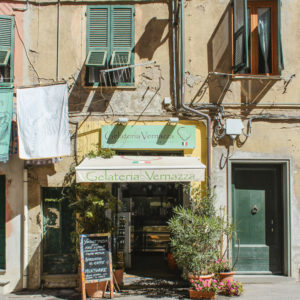 There’s also two locations in La Spezia so if you’re lucky, you can have it more than once (guilty). I’ve had my fair share of gelato and I’d like to think of myself as a bit of a connoisseur. This place has ruined me and now my previously delicious neighborhood gelateria is garbage in comparison. Cocco Nero (black coconut) has changed the way I think about Almond Joy bars and gelato combinations in general. 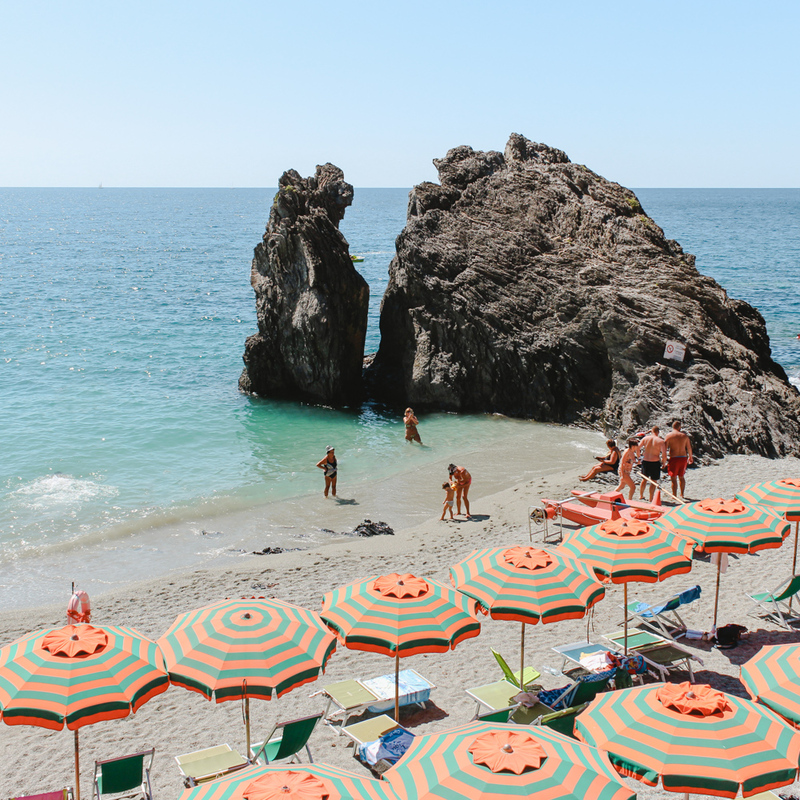 Around noon is the perfect time to roll into Monterosso for two reasons: the beach and lunch. Farinata is a regional specialty made of ceci flour (garbanzo beans) and I can’t get enough of it. 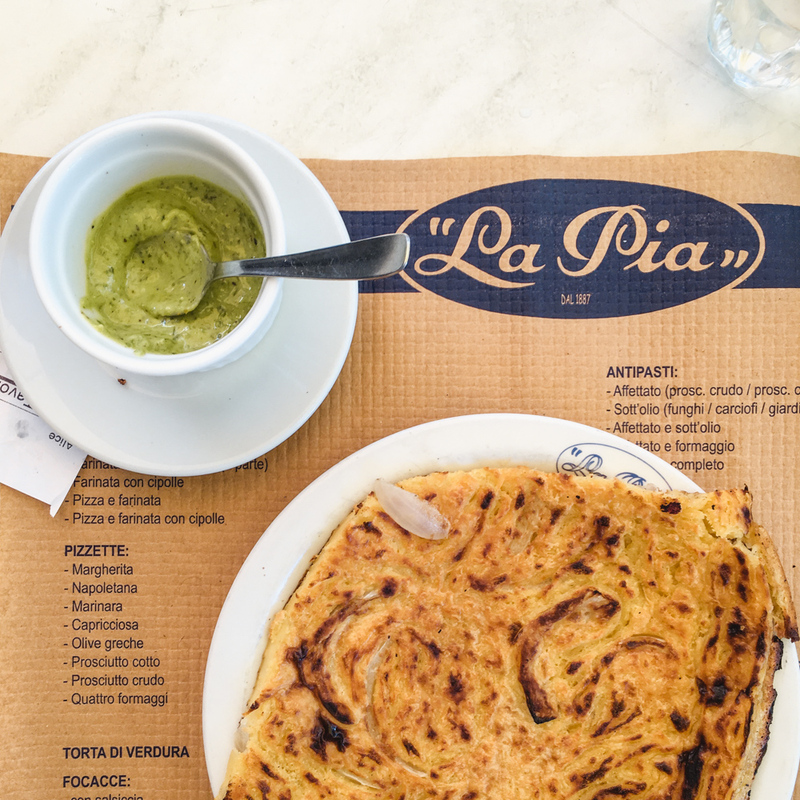 Il Frantoio and La Pia are great casual spots for farinata and sandwiches. Always say yes to pesto. 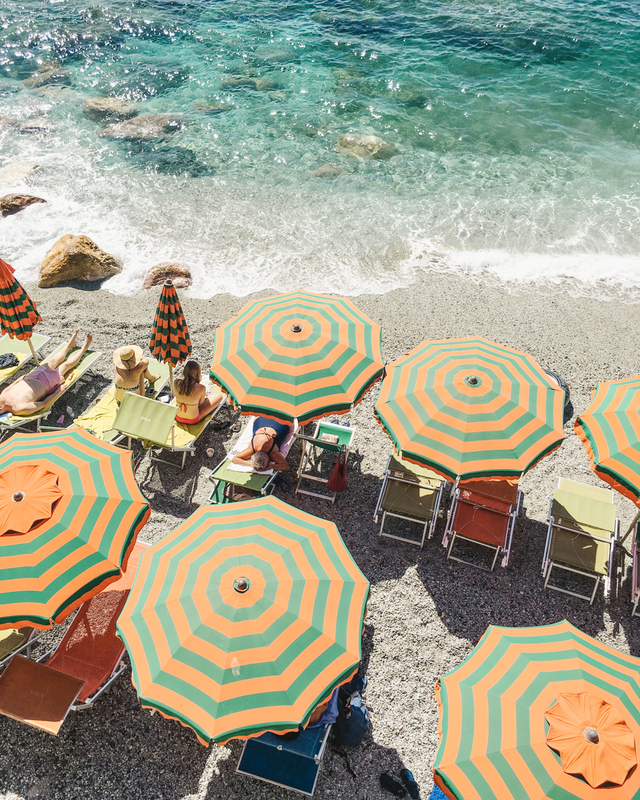 Monterosso al Mare is known for these happy umbrellas and Cinque Terre’s best sandy beach. 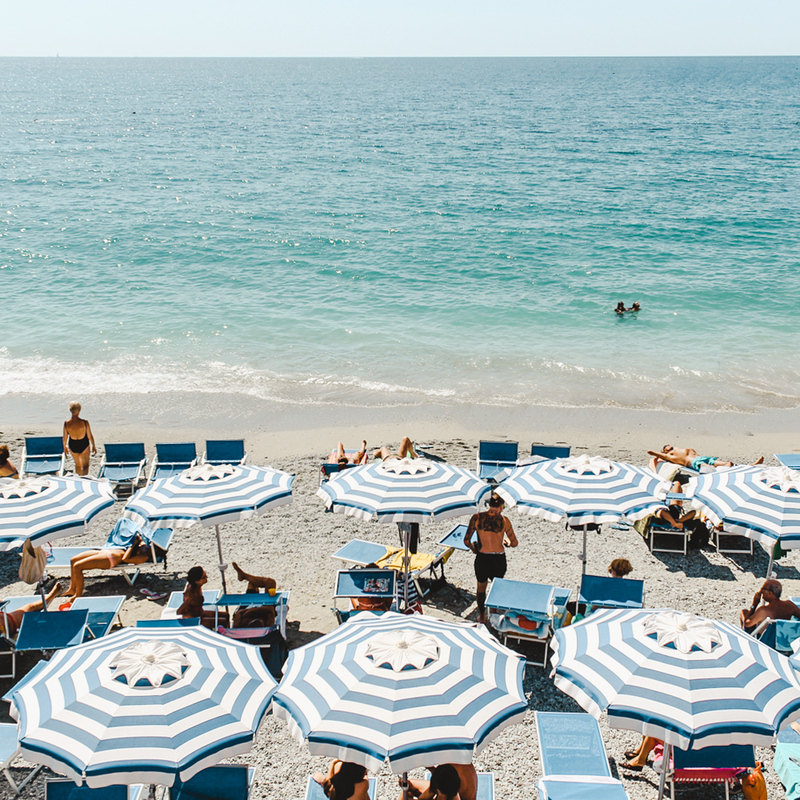 Take a dip in the ocean and post up at a lido (beach club). 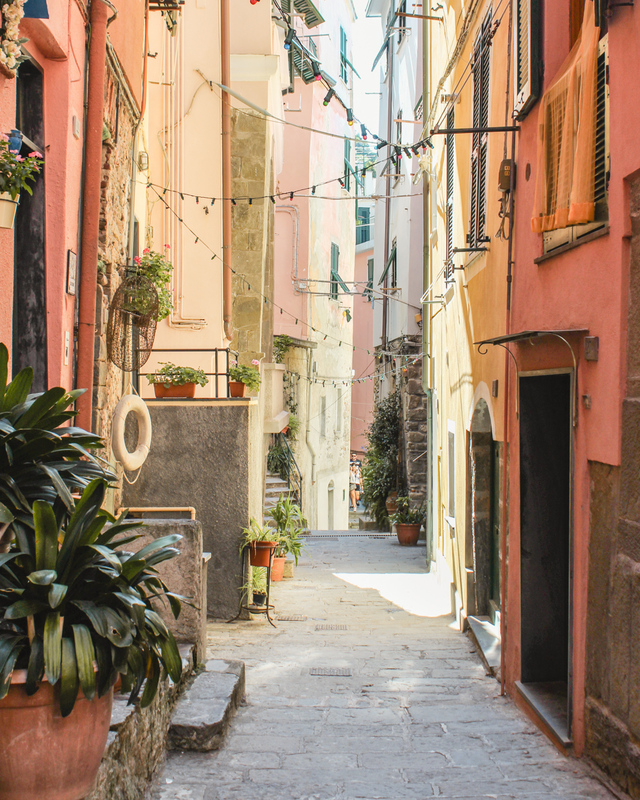 After exploring Monterosso, I headed back to the hotel in La Spezia to relax and get Alfie (if you’re new to the blog, that’s my adorable old rescue doggie that tags along with me). Alfie and I headed straight for Nessun Dorma for the best view in town with equally amazing drinks. You’ve probably seen this place pop up on your Instagram feed or Pinterest. 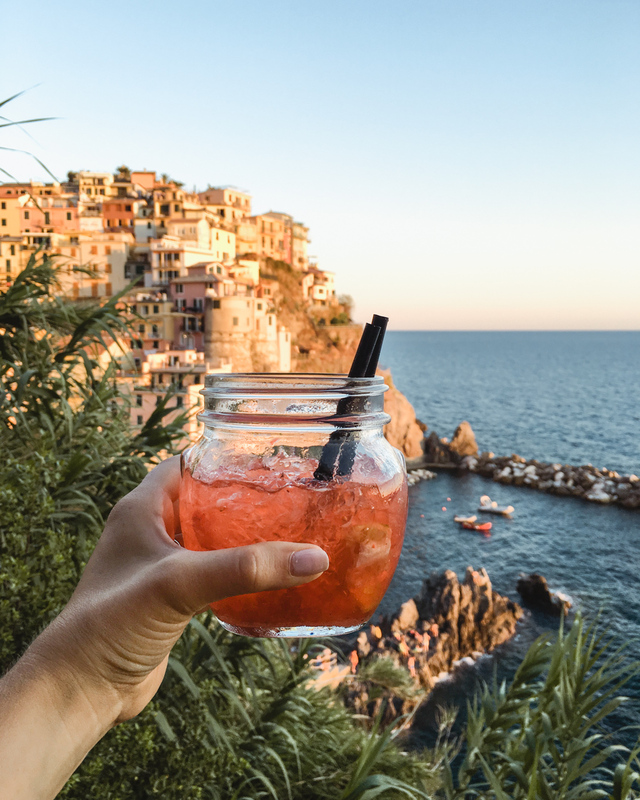 I love a good aperitivo and this is a must do if you’re in Manarola. 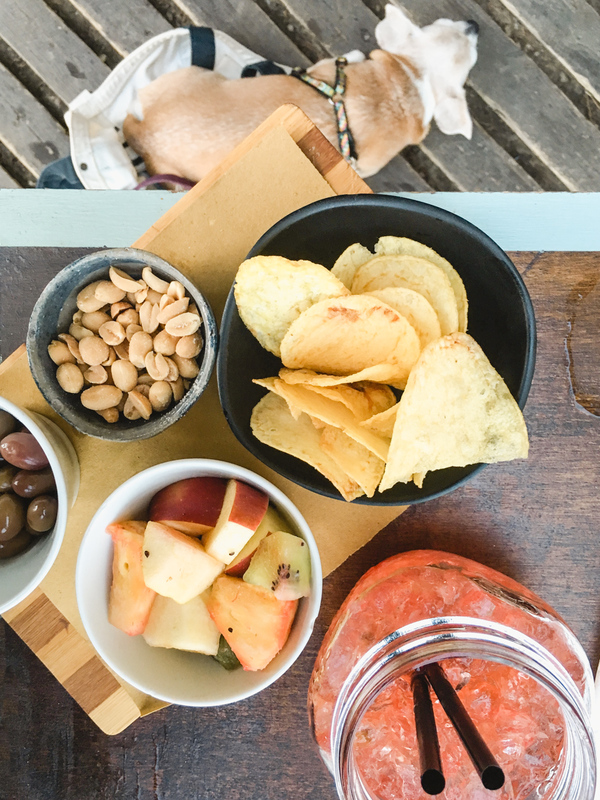 My €7 cocktail came with a little snack of peanuts, olives, fresh fruit and potato chips! Expect to wait in line, but it’s worth it! I woke up a little earlier than usual to get to Riomaggiore before the crowds and the August sun got too hot. I headed to the marina area and the only other people around were these fishermen. Small delivery trucks were still parked on the main street, a pedestrian street that would be filled with people in less than 2 hours. 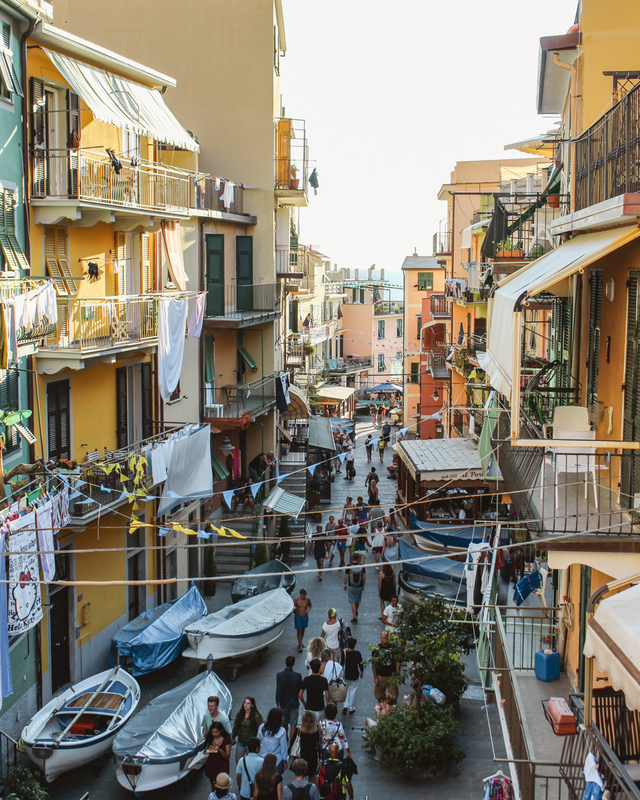 Have a caffé there and watch Riomaggiore come to life before heading to the next town. 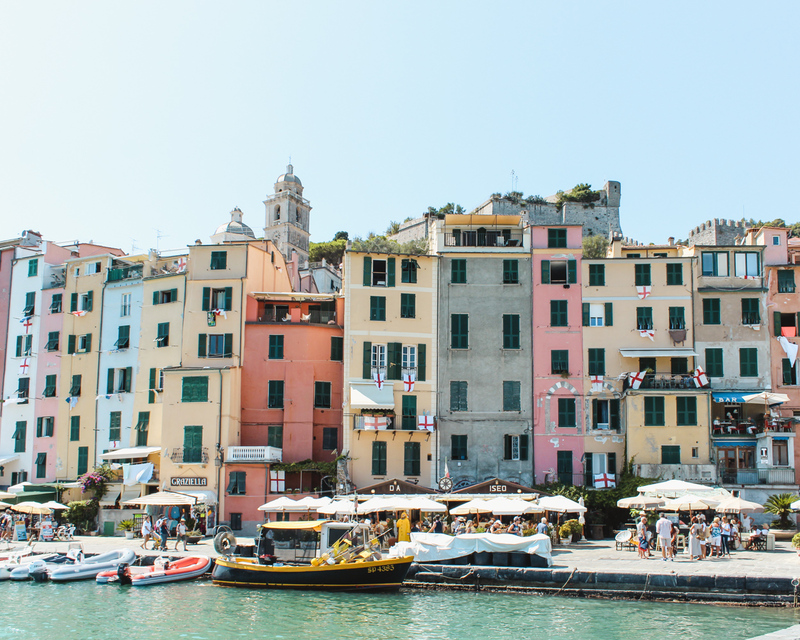 I decided to see Portovenere instead of Corniglia. 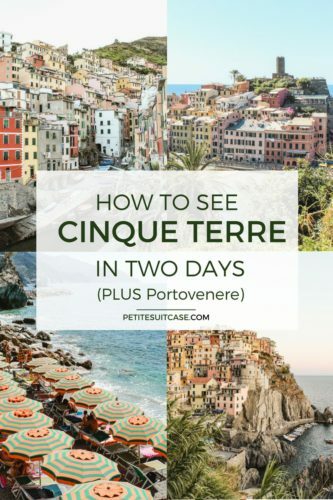 Now, I know that Portovenere isn’t technically part of Cinque Terre, but it’s considered the 6th town… so can I get a pass on this one? I feel a little guilty as this middle child commonly gets over shadowed by its stunning neighboring towns. If you’re determined to see all cinque towns that actually comprise Cinque Terre, this is where you would take the train from Riomaggiore to Cornigilia (it’s the only town not accessible by sea). 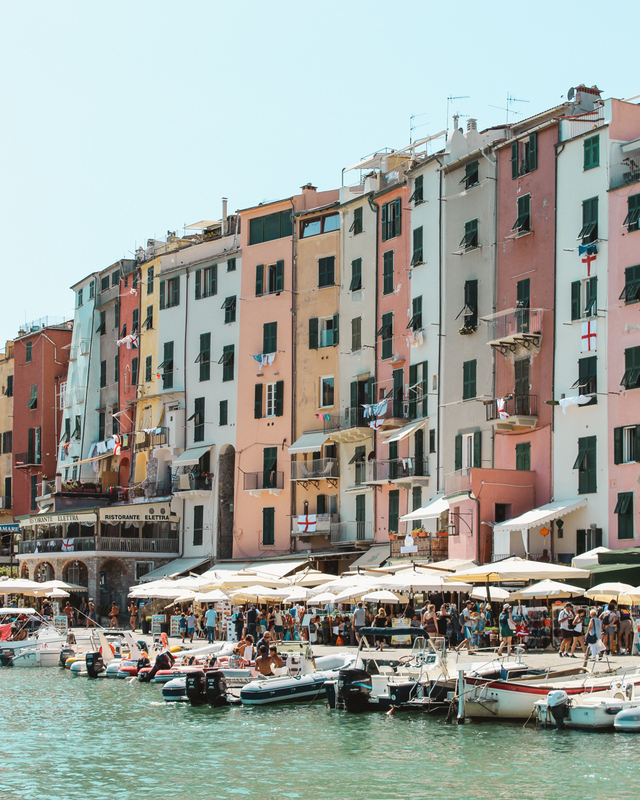 To get to Portovenere, you can take the bus from La Spezia or take a boat straight from Riomaggiore. 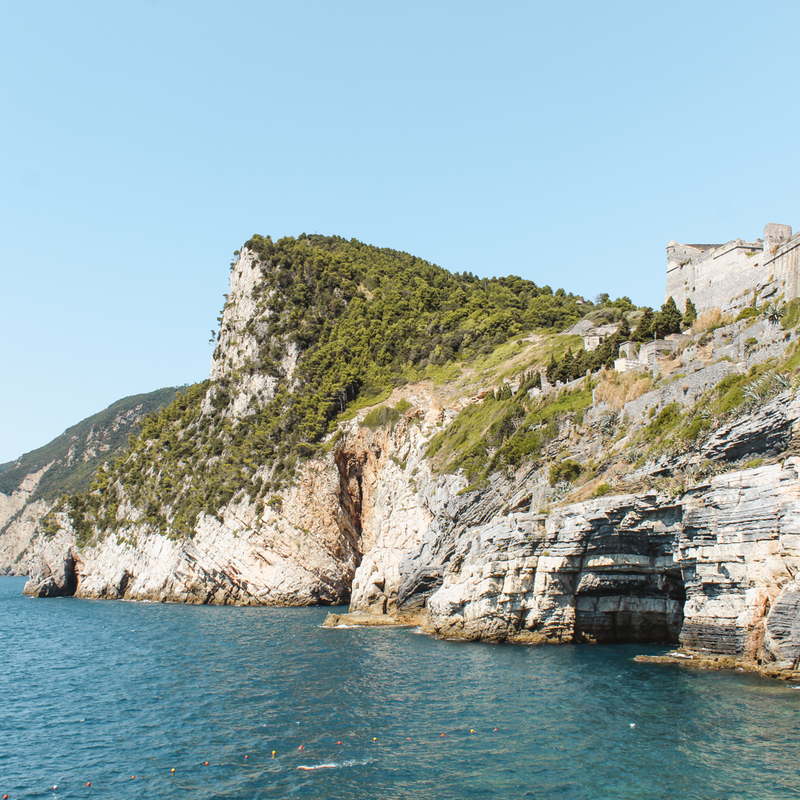 Around the back side of the main street in Portovenere you’ll find Grotta di Lord Byron. There’s no sand beach here, but people just sunbathe like lizards on the rocks. 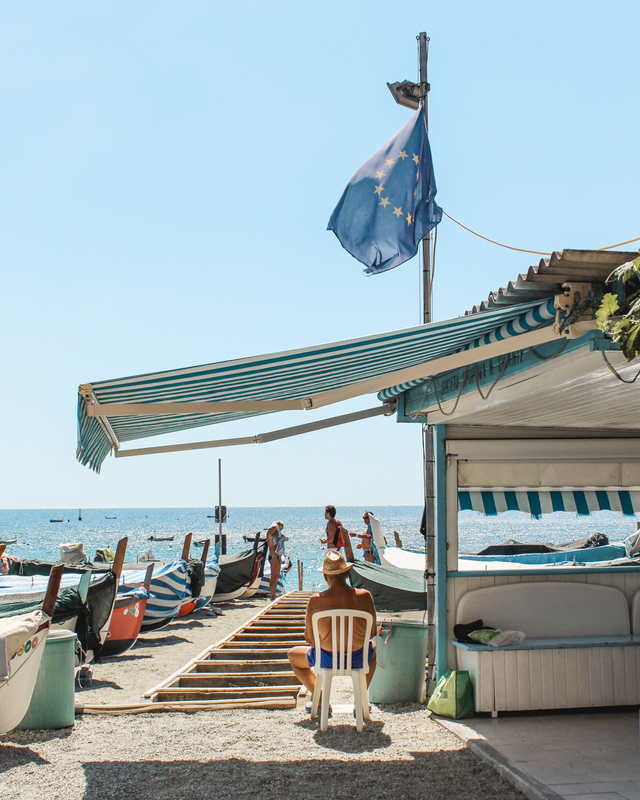 After a swim or a stroll through some of the shops, stop for lunch at one of the seaside restaurants. From Portovenere, I took the bus back to La Spezia and was back just in time for aperitivo hour and more gelato from Gelateria Vernazza! Trains run frequently to La Spezia Centrale from Rome and Florence. 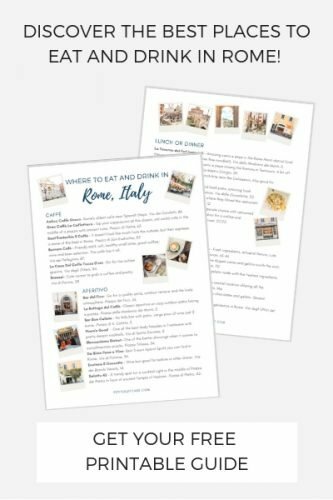 So, if you’re visiting Italy for an extended amount of time, it’s easy to add this itinerary on to a larger trip. 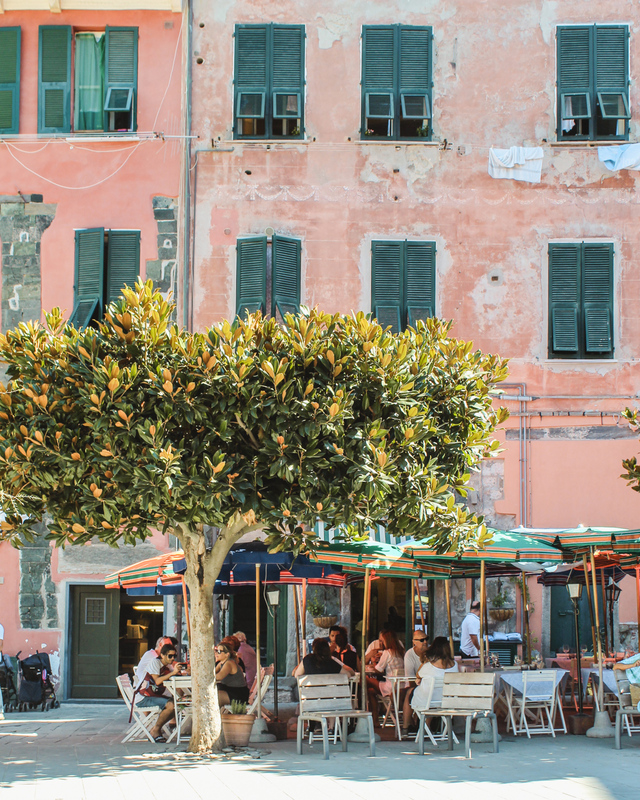 With the Cinque Terre Train Card you get unlimited travel between the towns, La Spezia and Levanto. 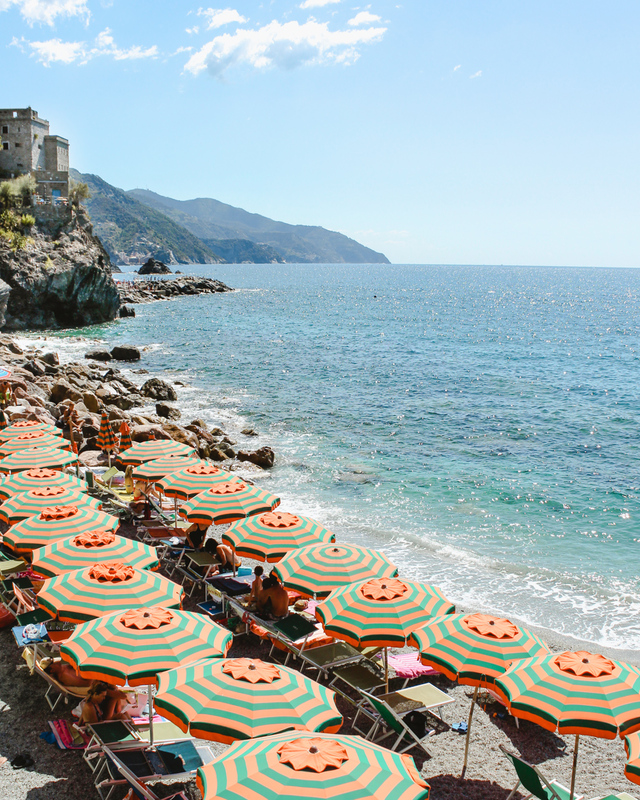 This is the way to go if you want to see Cinque Terre in two days. Trains run to and from La Spezia two to three times an hour from dawn to midnight. Italy has a slight allergy to punctuality and these trains are no exception. There are also several ferry options that can take you to/from La Spezia and between the towns. Years ago when I visited Cinque Terra with some girls from my study abroad group, we hiked between most towns. Only a few trails are still open, so double check which ones are open before planning a hiking trip. 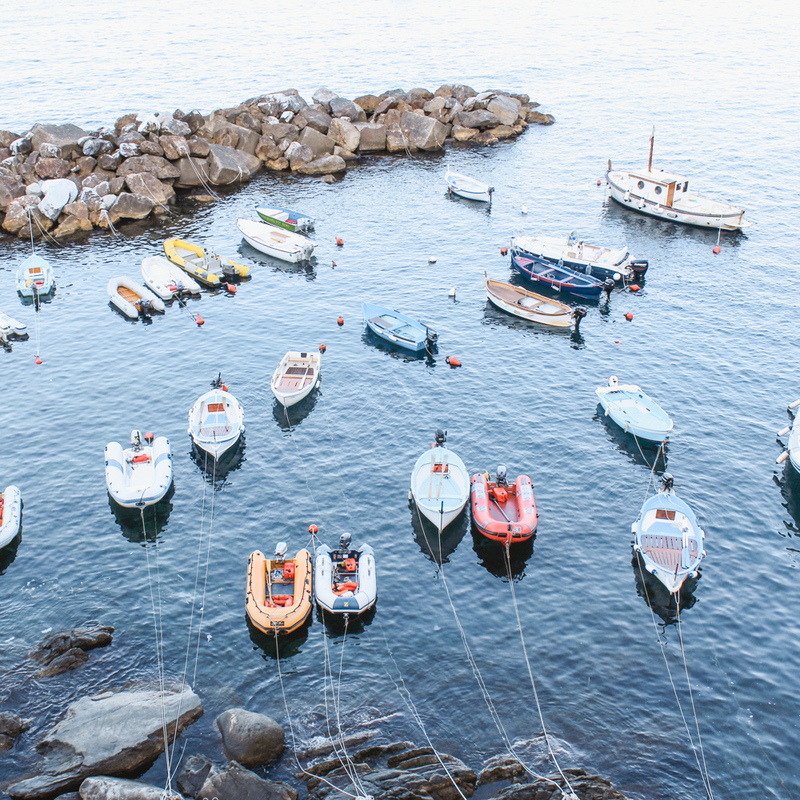 Cinque Terre is not known for big, modern hotels. 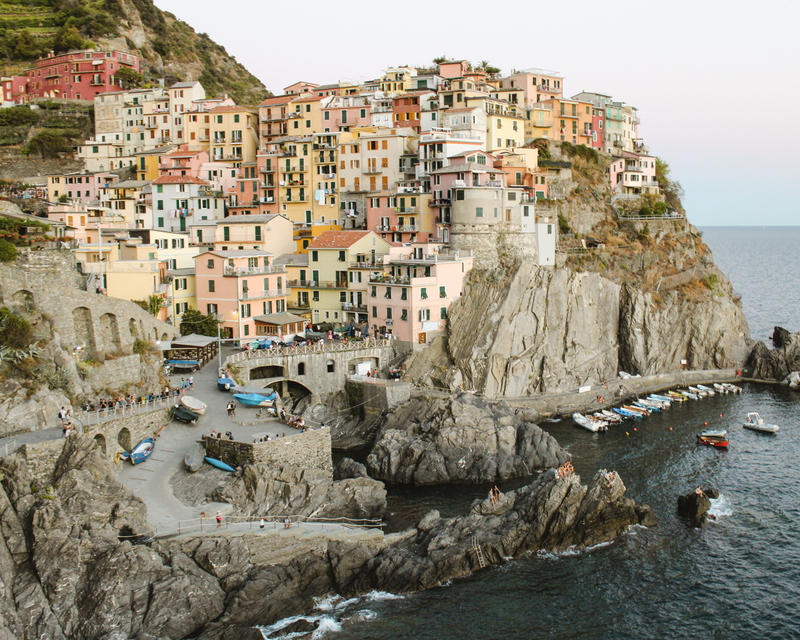 I’ve been to Cinque Terre several times and I’ve stayed in La Spezia, Riomaggiore and Vernazza. 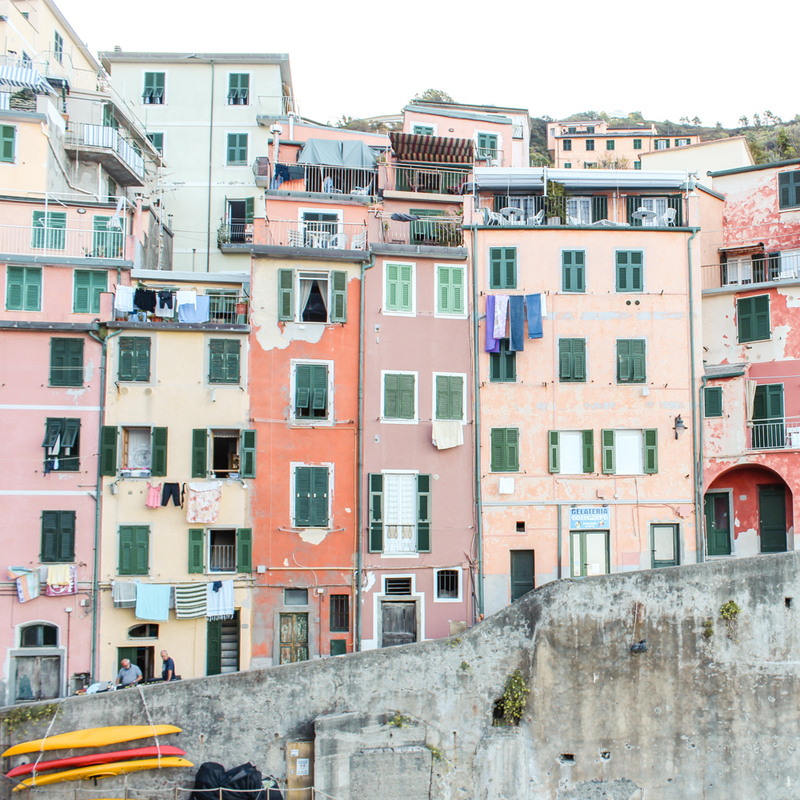 I’d really recommend this airbnb in Riomaggiore. The host was so kind and there’s even parking! More train information and prices can be found here. Love those beach shots, with the unique combinations of colors and curves! ?? So nice to see all the photos bigger than a tiny square on Instagram! I love them all and CT is definitely on my list in the next few years. Thank you, Hannah! 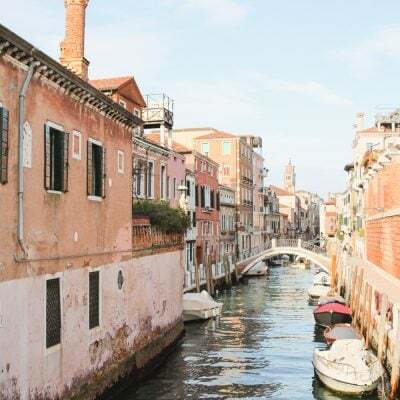 You’d love exploring all the side streets and seeing the stunning views! HI there, I was jus wondering what hotel you stayed in while you explored Cinque Terre? 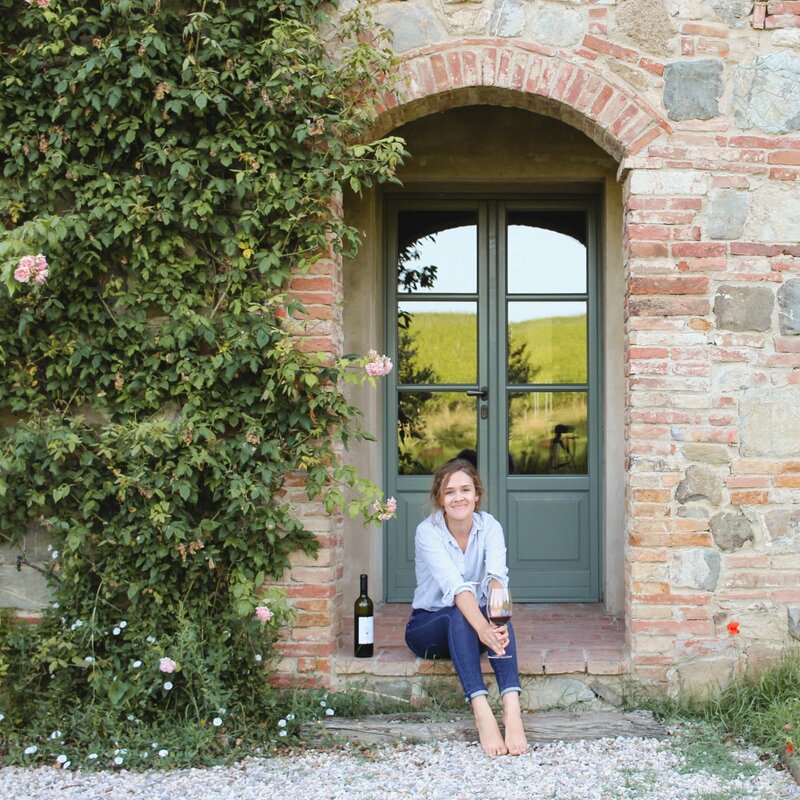 Hi Hayley, I’ve been a few times and have stayed in Vernazza, La Spezia and Riomaggiore. I’d recommend this airbnb. The host was very nice and the apartment was in a good location with parking available (a rarity in Cinque Terre). Can you just let me know specifically what are the charges for using ferries to travel between the 5 islands. Also, is there a 2-day pass for ferries? Hi Shoeb, I don’t know the exact prices. You should be able to find more info/schedules if you google it or read TripAdvisor reviews. Hi! Going to CT tomorrow and having a slight panic attack that I can’t find which trails are open/closed to hike. Had been planning on hiking the entire thing but it sounds like that might not be possible. Any assistance would be greatly appreciated! Thanks! Last time I went in June, quite a few routes were closed. I don’t think hiking the whole thing will be possible, but there are tourist info points in each town that will be able to help. You might want to read some reviews on Trip Advisor too in order to get an idea of which paths are accessible at this time.